The birding on the Meadow has been rather "samey" of late. Winter duck numbers are decreasing and the gull roost is offering very meagre pickings. Still there has been a noticeable pick-up in wader activity with a recent BLACK-TAILED GODWIT, several REDSHANK and a few DUNLIN all having been seen. 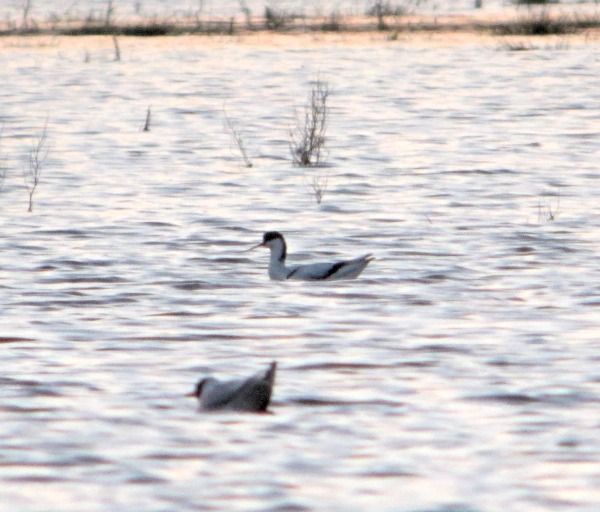 The highlight though was today when an AVOCET was found, initially swimming out in the middle of the floods before exploring the shore as the light started to fade. You may recall that we had an Avocet earlier in the year but that bird had been ringed and was presumed to be an escape from some collection, partly because of the strange time of year that it had been found. On the other hand an Avocet in March is much more likely to be a wild bird and indeed we've had them on the Meadow in this month in the past. This bird was also fortunately not ringed so I have no problems with adding it to the year list. In other news, after my mentioning the BARN OWL in my last post, Martin Gebauer had great views of it this evening hunting in Burgess Field. It appears to have been around for several weeks now so a trip there at dusk may well pay off. Talking of Owls, Steve Goddard reports that he's had a TAWNY OWL up in Wolvercote so that's now two Owls on the year list! With the first Sand Martin and the first Wheatear of the year now both reported at Farmoor it's time to start looking out for the first migrants on the Meadow.